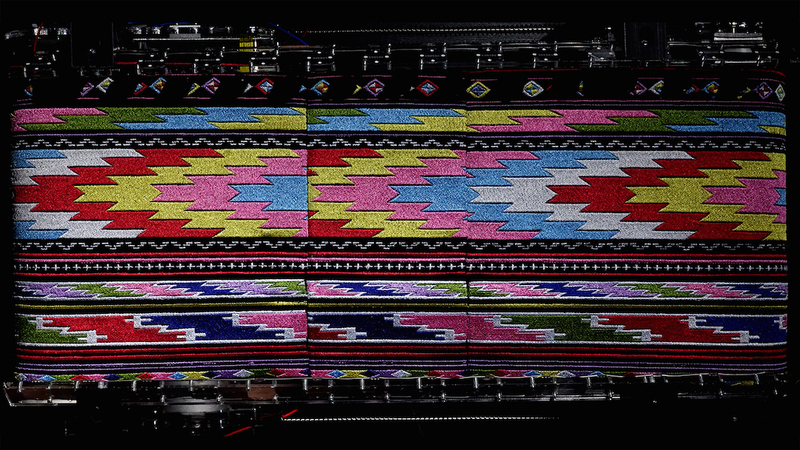 Textile Story from witaya junma on Vimeo. The exhibition uses beautiful traditional Thai fabric patterns that have complexity as they are neatly designed and sewn, having symmetrical size of patterns in each line, with equal spacings all through. This symmetry of patterns goes along with the creation of animation, which is developed from persistence of vision technique— the technique that uses high speed still pictures put together until our brain perceives as motion pictures. 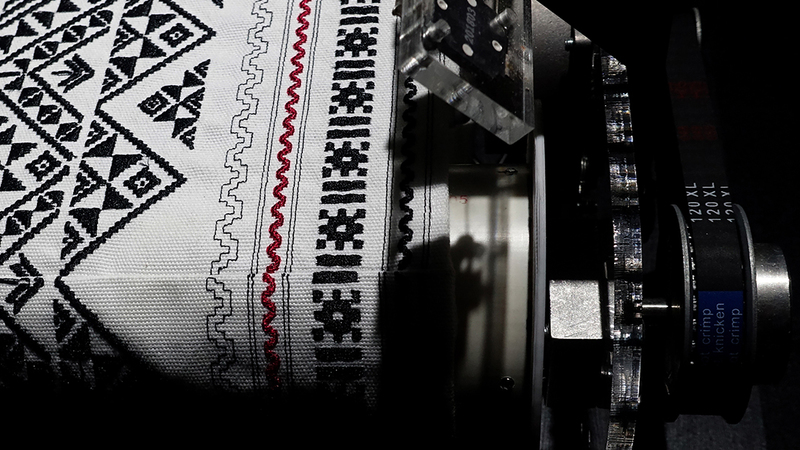 Audience members perceive the exhibition as if they are watching motion picture or movie that is made up of woven textile process, embroidered with the story behind the patterns of traditional Thai textile. This set of work is inspired by traditional Thai fabric patterns that have its own unique characteristics. The patterns vary in size i.e. small, medium, large, and in shades of colour, but are woven into one single piece of fabric that are delicately design with interesting details. 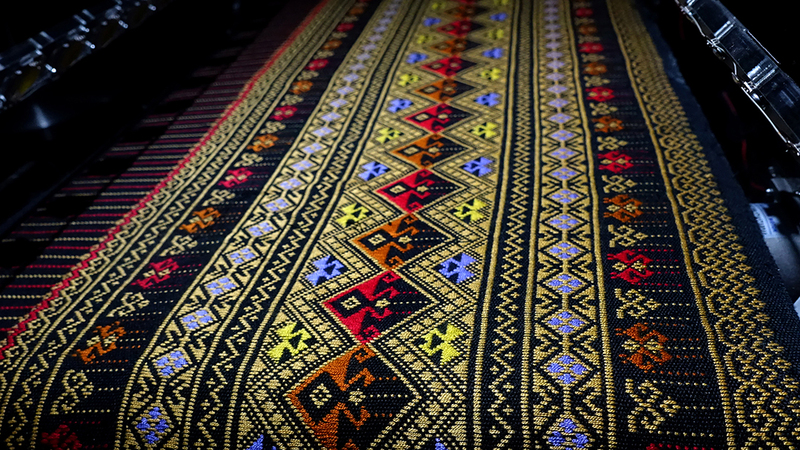 In the process of making, same patterns of traditional Thai textile that are symmetrical are embroidered and sewn into one piece of fabric. This results in the mixture of patterns that vary in size and spacing, some are specially adapted but are based on the traditional Thai textile. The animation of the textile represents hidden story behind it, regardless of the ancient of time that the patterns are created, they are portrayed and represented through time, culture, traditions, and beliefs. The moment the audience sees it then is similar to watching a motion picture or a film that are developed from the interwoven of textile, with the rhythmic creation that portrays stories through traditional Thai textile patterns. Apart from representing the beautiful story of traditional textile and bring it to life again, the exhibition also presents new perspectives to the audience, to let them question the surroundings whether or not there are hidden message, and tells you that our eyes can perceive and sense a lot more than we know. The patterns are copied into computer to create an appropriate size and components. Some are specially adapted but are still based on traditional patterns. 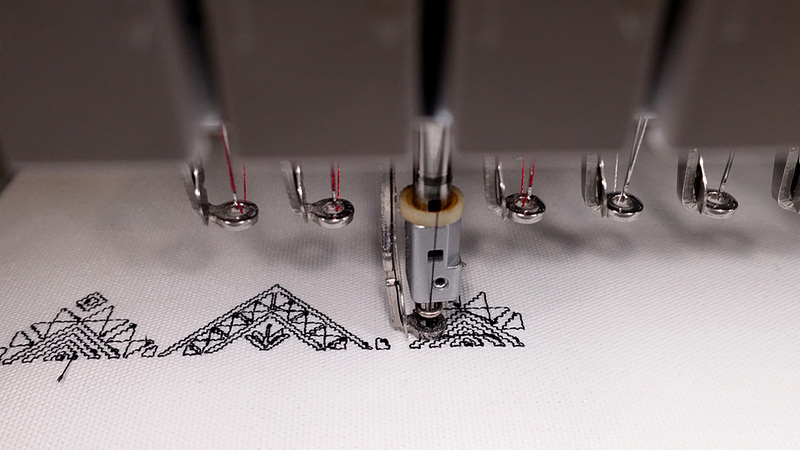 After that, the work is then sent to be embroidered by computer sewing machine, Brother PR-1050X, to follow the designed patterns. The completed fabric is placed onto the belt system where the two ends of the fabric are sewed together into a loop. The next step is the mimicking of the creation of animation, which was later developed into film screening, where the fabric is used instead of a movie film. 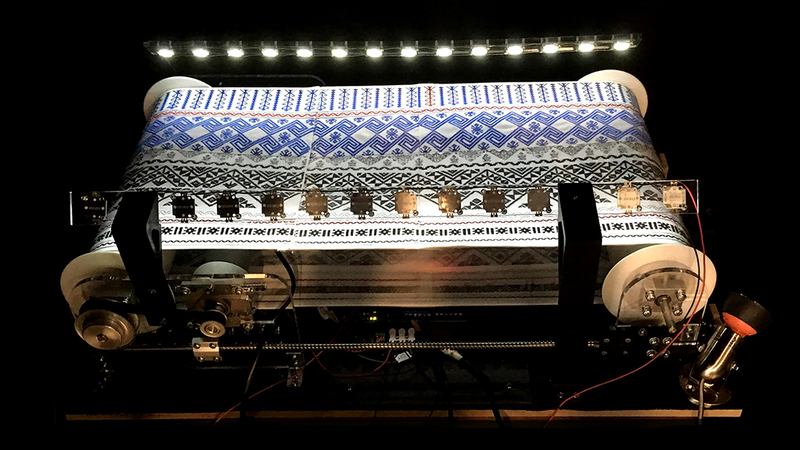 The technique involves us turning the fabric on the belt in a loop where the speed of turning is controlled, then a strobe light which creates Persistence of Vision is activated. This results in the patterns animating and coming to life. The artwork controls the rate of the strobe light, therefore, the speed and direction of the animation are dependent on the various patterns and sizes, and the rate of the strobe light. The artwork is comprised of 3 pieces of fabric, 50x70x23 cm. The structure is of a belt system, using 3D printing technique. The main structure is made up of wood, with total weight of 30kg (3 pieces total). Textiles are a mysterious expression of a particular place or human labor. Unassuming patterns or textures naturally reflect the topography of a location and the foodways or culture of a people. 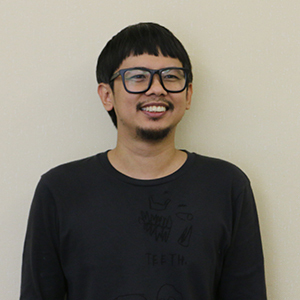 Recompiling traditional Thai expressions using modern digital fabrication technology gives us the feeling that we have seen this before, somewhere both nostalgic and futuristic. It is almost as if one can hear the breath of the Thai women working at the loom.